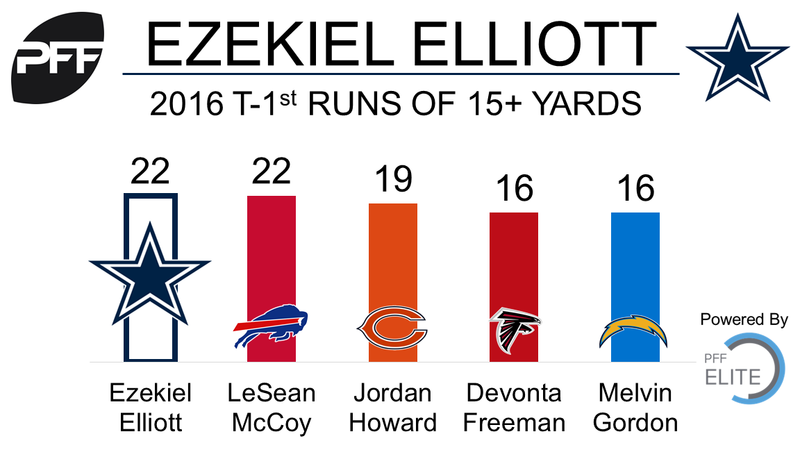 Ezekiel Elliott was suspended 6 games by the NFL. He was suspended due to a violation of the league’s domestic violence policy. Elliott had an outstanding rookie campaign, ending the year with the second highest overall grade among all running backs with an 88.8. Elliott only trailed Pittsburgh Steelers running back Le’Veon Bell, who finished with a 91.9 despite missing the first four games. Elliott was also a factor in the pass game for Dallas, leading all rookie backs in yards per route run (1.37), and showcased the ability to bust big runs, with a breakaway percentage of 33.7, ranking third among all rookie backs. His 22 runs of 15 or more yards tied for the overall NFL lead. The Bills dealt for WR Jordan Matthews. They sent CB Ronald Darby away to the Eagles in the trade and netted Matthews and a 2018 third-round pick. In transitioning from Rex Ryan’s man-heavy scheme to Sean McDermott and Leslie Frazier’s zone preference, the former second-round pick from Florida State may have been viewed as a poor fit. However, in 2016 he actually allowed a lower passer rating (85.2) in zone that in man coverage (123.2). After running 67.1 percent, 92.7 percent and 92.4 percent percent of his routes from the slot in his three seasons in the league, it will be interesting to see where the Bills use Matthews, as the recently-acquired Anquan Boldin (82.9 percent of his routes from a slot a season ago) appears poised to man the inside for the Bills’ passing game. Both players will be looking to improve upon shaky 2016 seasons, where Darby allowed the sixth-most yards per coverage snap (1.63) among cornerbacks with more than 355 snaps in coverage, while Matthews was just 35th among 51 wide receivers with more than 337 routes run in yards per route run (1.64). The second trade the Bills made included WR Sammy Watkins. Watkins will now play for the Rams, as they traded a second-round pick and E.J. Gaines for Watkins and a sixth-round pick. Watkins battled injuries last season playing in only 381 snaps, the lowest number of his career. The former Clemson Tiger ranked 47th among 115 WRs with a 76.8 overall grade. 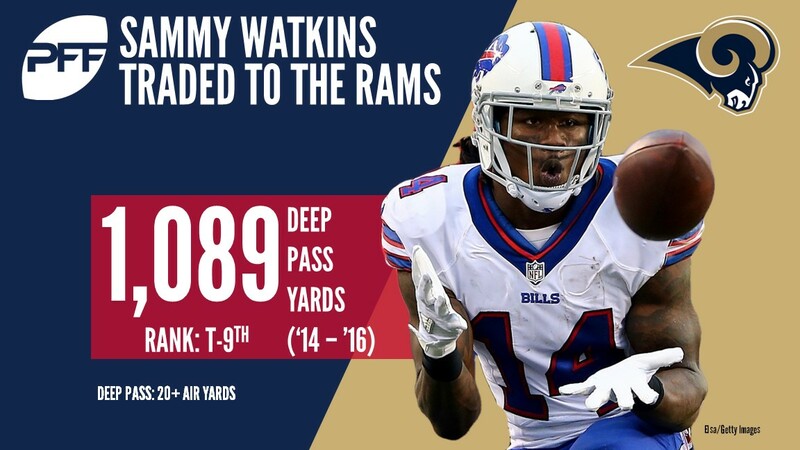 Watkins’ best year was in 2015, when he earned an 87.5 overall grade – 11th-best among WRs. His 2.69 yards per route run ranked fifth in the NFL that year as well. Gaines is coming off a poor year – his 37.0 overall grade ranked 105th of 110 qualifying CBs. Washington’s Trent Murphy will miss the 2017 season with a knee injury. Murphy tore his ACL and MCL in the preseason opener against Baltimore. In 2016, Murphy emerged as a potential long-term partner for pass-rusher Ryan Kerrigan, and saw a career-high in sacks (10), total pressures (55) and ranked 10th of 57 qualifying outside linebackers with a pass-rush productivity (the PFF metric that measures pressure on a per snap basis with weighting towards sacks) of 11.8. Murphy’s absence will now intensify competition between rookie Ryan Anderson and eighth-year veteran Junior Galette. Anderson showed flashes on Thursday’s game, notching two tackles and twostops in run defense, and while Junior Galette is still waiting for his first game with the Redskins, reports from Richmond indicate he’s close to the 2014 form, where he led all 4-3 defensive ends with a pass-rush productivity of 12.2. The Ravens lost G Alex Lewis for the season with a shoulder injury. Lewis was an expected starter along the offensive line. Lewis was expected to start at left guard in 2017 after a sub-par rookie campaign in which he started three games at left tackle and five at left guard. His overall grade of 45.6 (60th) was heavily influenced by his poor play at left tackle. In his eight starts, Lewis surrendered just one sack. He allowed eight total pressures at left guard while allowing 21 at left tackle. 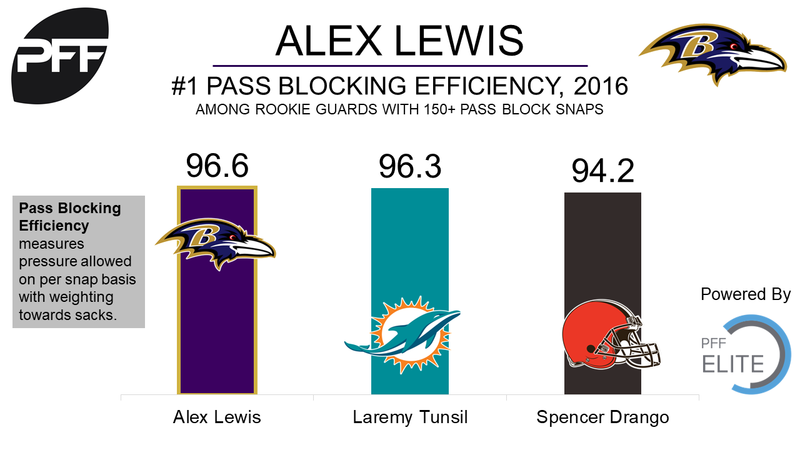 The Ravens were hoping to settle Lewis into a single position (left guard) where he could more easily improve his overall performance.